This is a description of what I did to add this feature on my 1998 BMW M3. I recommend thinking through what you are doing very carefully before actually doing anything. Take your time, and double check everything you do. I won't be held responsible for anyone attempting this on their own. You cut, drill, bend, burn, melt or break pieces of your car at your own risk. I am also assuming some basic knowledge of wiring and automotive modification. I don't describe every step in minute detail. If you don't know how to solder, stop here and get someone to help you. 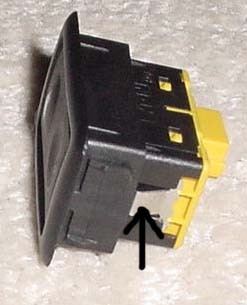 If you don't know how to remove interior trim pieces, stop now and get someone to help you. Ok, I wanted a blue interior. I like blue, plain and simple. That BMW orange interior is just too blah for me. 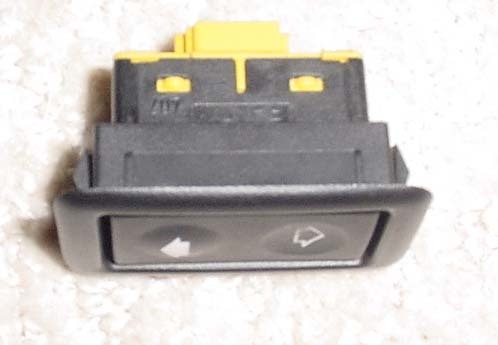 I started with the sunroof switch because it was easy to get to, and I figured if I blew something up, that would be the cheapest component to blow up, and the least necessary (Its winter! No need for sunroof!). I got everything from Radio Shack. I already had a soldering iron and solder, but both are cheap from Radio Shack. 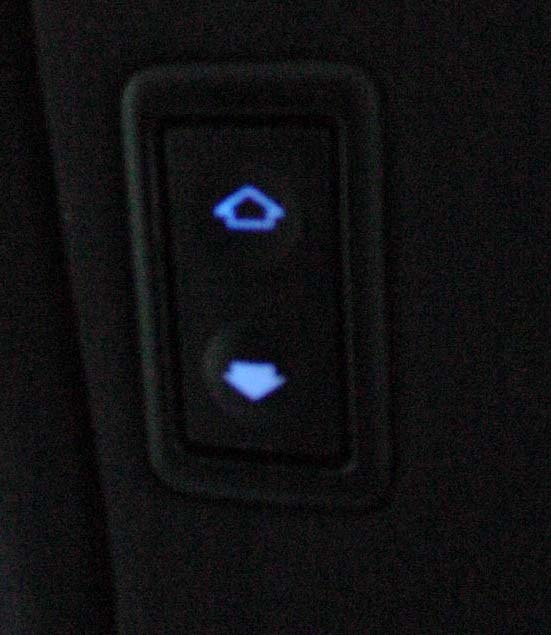 Basically, the stock orange LEDs are replaced with an LED color of your choice. This example is blue. In this example, a comparatively large LED is used. I recommend using the right size, which may be found at http://www.eled.com. I believe the 3mm is the correct size. You are on your own as far as the electrical specs of these components. I believe the stock ones to be 4 or 5 volts, 20-40 mA, 200-300 mcd, but these are just estimates. In this specific example, a 5V, 30 mA, 300 mcd blue 5mm LED was used. This size will not work in the radio, instrument cluster, OBC or climate control, but should work in all the switches. There are yellow, blue, red, green, white, orange (duh!) LEDs available, and MAYBE even purple LEDs somewhere, I am looking. Feel free to experiment. Again, please take your time when making any permanent modifications. In the picture above, it is an unfortunately blurry view of the bottom of the assembly. 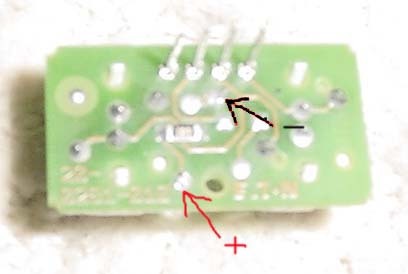 The two solder points marked with arrows above are where the LED leads connect, positive and negative. 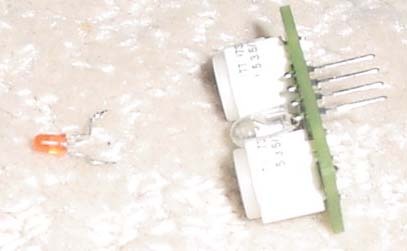 Heat the solder points and use pliers at the same time to pull at the LED to remove it. Be very careful what you are doing! You don't want to unsolder/cause a short by heating the wrong bits or being jittery! Use a third pair of hands like a vise if you can't be very careful! A small tip soldering iron helps. 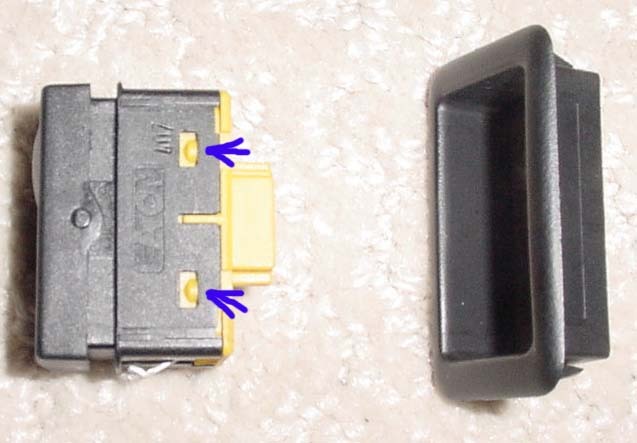 Remove both leads of the original orange led. If you look at the inside of the LED, you can see the anode and the cathode, which look different, and compare to the new LED. Generally speaking, it seems that the LEDs you get have a longer + positive lead and a shorter - negative lead. Your mileage may vary. Use a watch battery to compare the two LEDs to check for certain which is positive and which is negative. Bend the new LED leads like the stock one, the closer the better. The new LED in the picture above is much larger than the stock one. The stock one may be 2 mm, not 3 mm, certainly not 5 mm as above. Again, please be very careful what you are doing and take your time. You don't want to ruin any components. 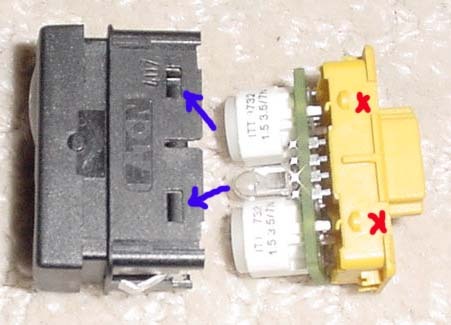 Other interior switches should be very similar. I have not examined any others. The instrument cluster, OBC, climate control and radio should all be similar, however I have only examined the OBC. This will require small LEDs. Not sure if 3mm will work, and 2mm is a special order, I have not found yet. Depending on what LEDs you get, and what their electrical specs, the effect may be different. Some LEDs are clear, some are color diffused, like the stock switch LED. Some are color transparent like the OBC. In the OBC, there are plastic optical reflection panels that direct the light output from LEDs. This could take a specific viewing angle, intensity, size, etc. This write-up will evolve as my knowledge of the other interior bits becomes available.